Ocala, Florida — On January 13, 2014, Deputy Jacobs responded to the Murphy U.S.A. gas station, located at 17840 SE 112 Court Road in reference to a gas drive off. The store clerk told the deputy that a vehicle with one male and one female pulled up to get gas. The clerk said that the female got out and pumped gas while the man waited in the driver’s seat. According to reports, the clerk was able to give a detailed description of both suspects and noted the tag number of the vehicle. The license plate on the vehicle was registered to an Orlando rental car company. Security footage from the store was obtained and both suspects were identified. On January 15, 2014, both suspects were tracked down using surveillance footage and information from the rental car company. 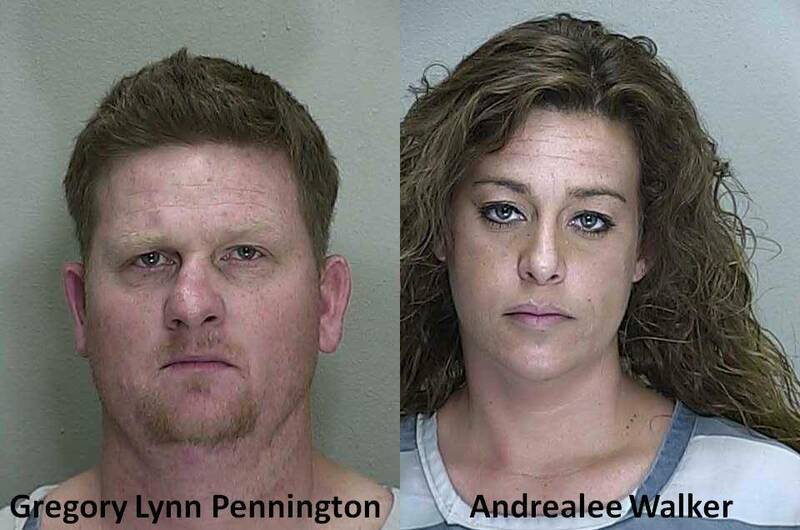 Gregory Lynn Pennington, 38, and Andrealee Walker, 32, were arrested at their home. Records show that Pennington was released from Jail exactly one year ago today for battery. He has been arrested nine other times between 2006 and 2013 on charges of Felony Credit Card Fraud, Felony Larceny of $100,000 or more, Armed Burglary, multiple Felony Violation of Probation violations, and Dealing in Stolen Property. Walker has been arrested four other times on charges of Distribution of Heroin, Manufacturing of Methamphetamine, Burglary, Grand Theft, Dealing in Stolen Property, DUI, and has also violated probation multiple times. Both Walker and Pennington are currently booked into the Marion County Jail. The total amount of gas stolen was $25.18.